The Sapira mattress by Leesa is a hybrid foam-over-pocketed-coil mattress that competes with many other online mattresses. How did it perform in our evaluations? Note: Among companies selling mattresses directly online, Leesa has one of the longer track records, going back to 2014. See our Leesa mattress review, where we cover the company's signature mattress, an all-foam bed. 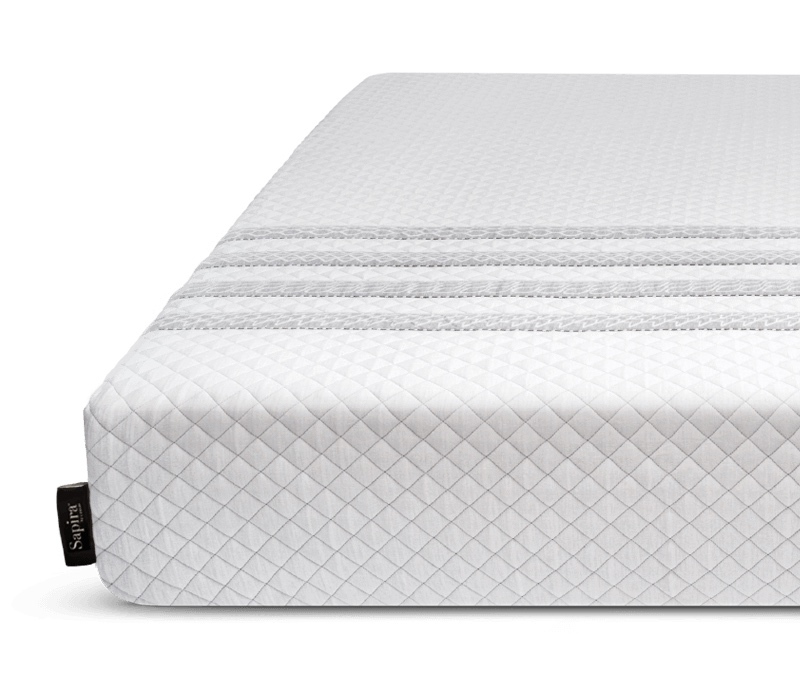 In this report, we examine the company's Sapira mattress, a hybrid bed with latex and memory foam over pocketed coil construction. If you’d prefer to watch rather than read, check out our full Sapira mattress video review above. GoodBed's Take – Who is the Best Match for a Sapira Mattress? The Sapira mattress by Leesa is an 11" hybrid mattress using foam over pocketed coil construction. This is a fairly common type of mattress these days, so we were interested to see how the Sapira bed stands out. The Sapira bed has five total layers, including Leesa's latex-like proprietary Avena foam; we did find that it had properties similar to latex, including good pressure-relieving characteristics. The main support portion of the mattress is a pocketed coil unit with firmer, slimmer coils around the edges of the bed. Edge support was a highlight in our testing, and we felt the Sapira bed would be a good choice for those who sleep right on the edge of their bed. We judged the Sapira mattress a Medium Firm bed on our softness scale. In our tests, it proved supportive and promoted very good spinal alignment for our 200-lb. tester particularly in back sleeping and stomach sleeping positions. We felt it would be similarly supportive for those around our tester's weight and heavier. We did have some questions about those much lighter than our tester, who might not be heavy enough to sink into the mattress to create the good spinal alignment our tester experienced. For side sleeping, our tester felt his shoulders could have sunk a little more into the mattress; again, we felt the Sapira might be too firm for lighter sleepers, but find for heavier speakers. Overall, we felt this mattress would suit a wide range of individuals. While the Sapira bed does have a small amount of memory foam, we would not call it a memory foam mattress, as it has very little of that slow-melting-into-the-bed feel that we associate with memory foam. Rather, the Sapira bed was quick-responding, and recovers its shape very quickly after being compressed. Cushioning depth is little shallower than average, and we felt it would be a good match for those who prefer a feeling of floating on top of the mattress as opposed to sinking in deeply. Value-wise, the Sapira bed has a lot of competition among other online mattresses, but Leesa has a bonus: you can try its beds in select Pottery Barn and West Elm stores (find locations), making it possible to try a Sapira bed before buying. Free shipping is included, but just as with any other package, it’s left at the door. A ‘white glove’ service is available as an upgrade for $100; that means the bed would be delivered and set up in the room where you want it. If you want your old bedding removed, that’s another $50. A Leesa 100-day trial is included, with free shipping both ways if you return the mattress. Note that the Sapira mattress does not come with a box spring (nor does it need one). You can place the bed atop the support of your choice, including a separately purchased box support, a bed frame, platform bed, or adjustable bed frame. Leesa sells its own bed frame and adjustable frame, but neither are required purchases. The Sapira bed is a hybrid mattress: part traditional coils, and part modern foams. The top layer is Leesa's proprietary "Avena" foam, a polyurethane foam that has latex-like properties. This is a quick-responding foam that's pierced with pin-core holes, much like traditional latex. Next is a 1.5" layer of memory foam in a 4 lb. density (memory foams typically used in mattresses range from 2 to 5 lbs. higher is better). After that is an inch of regular polyurethane foam; this foam doesn't serve a major comfort purpose, it's more of a transition between the foam and coil layers. The main pocketed coil unit is 6" tall. Two sets of narrower coils surround the edge. Lastly, there's another inch of polyurethane foam. 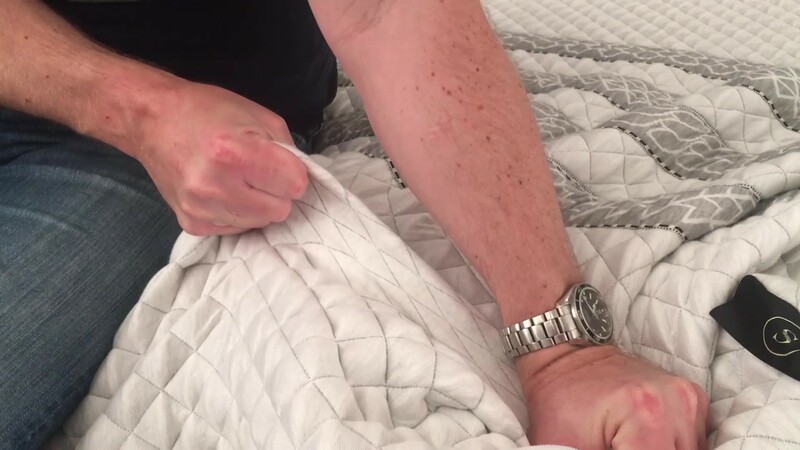 The layers of the Sapira mattress are wrapped in a non-removable fabric cover. We liked the cover: it's very smooth and stretchy; it feels good to the touch. We pulled and tugged at it in our tests and found it to be well made and sturdy. We classify the Sapira mattress as a Medium Firm bed on our scale. Compared to the company's other mattress, the Leesa, this is a firmer bed. This refers to how deeply you sink into the mattress or feel cradled or hugged by your mattress; how far you sink into it. The Sapira mattress has a shallower than average cushioning depth, so the feeling on this mattress is more floating-on-top than sinking in deeply. The Sapira mattress does have a layer of memory foam, but it isn't the top layer. When we pressed down on the mattress, we did notice some delay in returning back to shape, but when laying on the mattress, we really did not notice much of that memory feel. Overall, we would call this a fast-responding bed. Responsiveness also translates to bounce. Many mattresses with a coil unit have quite a bit of bounce, but in the Sapira mattress, the memory foam layer tends to absorb any bounce that might be generated by the pocketed coils. The net effect is a mattress with less bounce than we expected. In our evaluations, the Sapira mattress from Leesa afforded very good back support and spinal alignment, particularly for back and stomach sleepers. We also felt it would be a good choice for heavier individuals, even heavier stomach sleepers, which can have a harder time finding a mattress that's supportive enough. We did have some questions about its suitability for very light persons, who might not sink into the mattress enough. In our evaluation, we felt the Sapira bed would be an excellent choice for most back sleepers. Our 200-lb. tester felt his hips sinking into the mattress just the right amount, even while he felt the mattress reaching up to support his lumbar area. We felt the Sapira bed would be a good choice for most back sleepers of average weight, including those who might be heavier than our tester. We did question whether the Sapira mattress might be too firm for those much lighter than our tester, because persons weighing less than 100 or 150 lbs. might not be heavy enough to compress the mattress enough to create appropriate spinal alignment. The Sapira mattress is a firm bed, and that can make side sleeping tricky; a bed must be soft enough in order for shoulders and hips to sink into the mattress enough to create a neutral spinal position. For our 200 lb. tester, he felt his shoulder not quite able to sink enough into the mattress, resulting in an upward tilt to his spine. We felt that persons heavier than our tester would likely be fine in a side-sleeping position, as they would be able to sink a bit more into the mattress. We would be concerned about significantly lighter side sleepers, who might not be heavy enough to compress the foam with their shoulders or hips. Achieving good spinal alignment for stomach sleepers can often be trickier as the hips can tend to sink down too far with some mattresses, but our tester felt well supported in this position on the Sapira mattress, and felt that stomach sleepers of any weight would also be well supported. Even though our 200-lb. tester felt his shoulders were not sinking quite enough into the mattress, he didn't feel any issues with pressure points or joints. We felt that those around our tester's weight, and heavier, would also experience very good pressure relief on the Sapira mattress. We questioned pressure relief for lighter persons, and for those who are curvier (e.g. those with broad shoulders or hips), who may find the Sapira bed too firm. With a bowling pin standing upright on the Sapira bed, we tested motion isolation first by dropping our 16-lb. 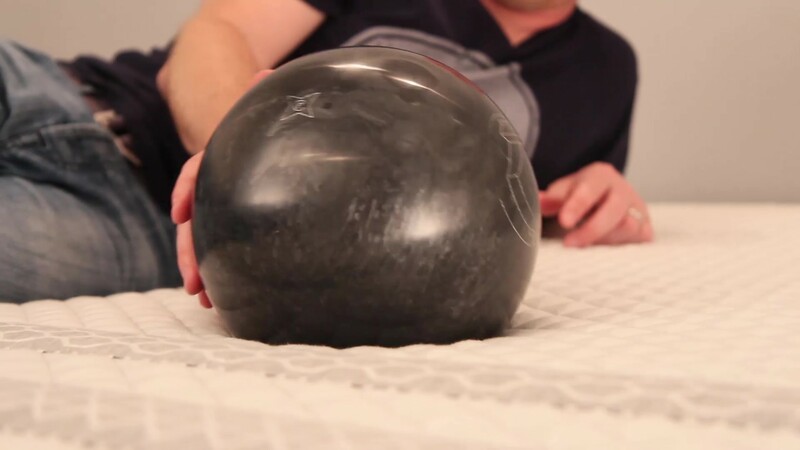 bowling ball on the bed, then with our tester dropping his body weight on the bed. Either way, there was almost no movement from our bowling pin, which leads us to conclude that the Sapira mattress would be a very good choice for those sensitive to a partner’s movements in bed. Innerspring and pocketed coil mattresses often are not the best at motion isolation, but the Sapira is doing a very good job at that; the memory foam on top of the pocketed coil layer seems to help dampen any movement transferred by the coil unit. For most people, we do not think the Sapira mattress will feel hot. Memory foam has a reputation for heat retention, but in the case of the Sapira bed, the memory foam layer is not on top. 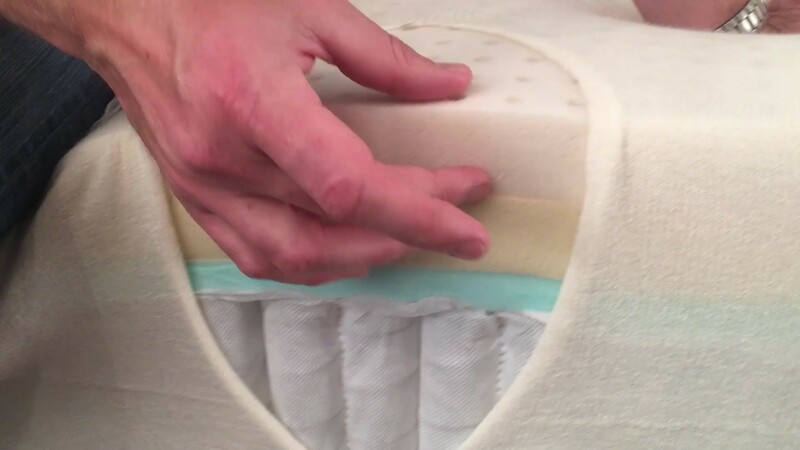 Furthermore, the bed’s top Avena foam layer has pin-core holes piercing the top layer to help promote airflow. The largest portion of the bed is comprised of the pocketed coil unit, which is made of steel, thin fabric pockets, and air, so naturally air should flow well. Some innerspring mattresses have a foam edge support, but the Sapira features two rows of firmer coils around the edge, so air can move in and out of the sides of the mattress. Lastly, the shallower cushioning depth of the Sapira mattress means that less of your body is exposed to air. The pocketed coil unit of the Sapira mattress has two rows of narrower, firmer coils around the edge specifically for edge report. In our testing, this edge support worked very well. While sitting on the edge of the bed, our tester felt very stable. When laying on the very edge of the mattress, our tester also felt stable, and didn’t feel he was slipping or leaning at all. If you tend to sleep on the edge of your bed, or find yourself pushed there by kids and pets, we think the Sapira mattress would be an excellent choice. One of the highlights of the Sapira by Leesa mattress, for our tester, was ease of movement. Mattresses with memory foam don’t have the best reputation when it comes to how easy it is to roll into different positions. However, the memory foam in the Sapira bed is two inches down, and the top Avena layer is a very responsive foam we felt had many behavioral qualities of latex. Our tester felt that changing positions was very easy. In the case of the Sapira mattress, the company makes no claims about the use of natural materials, however all of the foams used are certified to the CertiPUR-US standard, which verifies that a material has low VOC off-gassing as well as a lack of chemicals and other substances regulated by the CPSC. The coils are made of steel, which does not off-gas. The company does have some social initiatives. For every 10 mattresses sold, Leesa donates one mattress to charity. The company says that it has donated more than 30,000 mattresses so far to disaster recovery, homeless and women’s shelters, and Habitat for Humanity. Read more about Leesa's social initiatives on its website. The company also says it plants a tree for each mattress sold. We did not specifically test the Sapira bed with an adjustable base. However, the company sells its own adjustable base that can be used with its beds, and using an adjustable base (either Leesa’s adjustable base or another brand’s) will not void the warranty. Since the company endorses use of adjustable bases, we assume that compatibility is likely good. The Sapira is an 11-inch hybrid mattress made of foam over pocketed steel coils, with three inches of premium comfort materials, including Leesa's proprietary latex-like Avena foam, along with visco-elastic memory foam. The pocketed coil unit features a firmer two row of slimmer coils as edge support. The bed is covered in a sturdy, stretchy, nice-feeling cover. When it comes to estimating the comfort lifespan of a mattress, we tend to use foam density as our best, albeit imperfect, predictor of how long a foam will retain its shape and resiliency. In the case of the Sapira mattress, the top Avena foam is of 3.75 lb. density, with the memory foam a 4 lb. density. Both are high densities that indicate high-quality materials. Steel coils have a long track record for durability. Overall, we did not notice any red flags in terms of durability for the Sapira mattress. Pricing for the queen size Leesa bed is $1,595, a price that’s higher than many of its online-mattress competitors. The advantage, in our view, is Leesa's transparency with respect to the densities of the foams and gauge of the steel. That's information that likely won't be available when shopping in a mattress store. So compared to what you might find in a local store, we think the Sapira mattress is a good, but perhaps not an exceptional value. If you prefer to try a mattress in a store, you can find Leesa and Sapira beds in select Pottery Barn and West Elm stores (check the Leesa store locator), which could be very reassuring for those hesitant about ordering online before trying the bed. Leesa includes free delivery via common carrier (typically UPS) for the Sapira mattress, which is not particularly unusual among its competitors. For an extra $100, you can opt for their VIP or ‘white glove’ service, where the mattress is delivered and set up in the room where you want it, and the packaging is removed. Removal of your old bedding is another $50 option. Leesa offers buyers a 100-day trial period. Returns of the Sapira mattress within the trial period are free, with pickup of the mattress included. Returned mattresses will be donated to charity, according to the company. One of the biggest, if not THE biggest complaints about any mattress from consumers regards body impressions—the inability of a mattress to spring back, eventually creating a low spot/sinkhole in the mattress. As such, mattress warranties all contain a term defining how big a sag or ‘body impression’ (measured when no one is on the mattress) is considered a defect, and thus covered under the warranty. The industry standard for mattresses is generally between ¾” and 1.5”. Leesa has chosen to cover indentations that meet or exceed 1”. Practically speaking, that means any softening or sagging would need to be at least that deep before the warranty would offer you protection. Full details on Leesa's warranty and returns policy. Should you require warranty service, however, you are responsible for shipping both ways. Summary: Is the Sapira Mattress Right for You? Is the Sapira bed right for you? Take our Mattress Match Quiz to find mattresses that fit your needs, based on your preferences and price range. Looking for a little more on the Sapira mattress from Leesa? Visit Leesa.com.